Every business- commercial enterprises, organizations, individual business owners and even bloggers, needs a logo to build a good brand profile and help promote fast public recognition. A good logo needs to be smart enough to describe what your business is, and be attractive enough to create a positive brand image. That’s also why logo design services are always very expensive. If you’re looking for a simple and fast way to create a highly engaging logo to represent your brand, then give DesignEvo would be the right choice for you. It is an excellent online logo maker that tries to ease the complex design process for non-designers, and help them create logos in a comfortable and obviously creative way. DesignEvo comes with a very intuitive and user-friendly interface. There is no steep learning curves, and the whole process can be finished with simple clicks and mouse drags. As long as you has the basic knowledge to use a computer, that’s just enough. Users of all ages and levels can create a good logo design without having any experience in graphics designing. Besides, it works super fast and flawlessly. It uses HTML5 technology, which has well compatibility with almost all modern web browsers, such as Chrome, Firefox, Safari, Opera, Edge, IE11, etc. With DesignEvo, creating a professional and functional logo to support your brands is a breeze. DesignEvo has prepared over 4,000 fully customizable pre-designed templates for you to choose from, and that number is still growing. Templates cover a wide variety of fields, such as Business, Technology, Art, Education, Animal, Environment, Fashion, Food, Lifestyle and much more. There is no need to have prior knowledge or skill in graphic designing. Those templates can lend a hand and help you get started easily. You can browse them for design inspiration, or directly use them as a base. Every element can be fully customized, so you don’t need to worry that your logo would look like anyone else’s. You have total control to customize it with your own style and needs. DesignEvo offers millions of logo icons resources to help you further enhance your design. Icons come in vector formats, so you can freely resize them in full quality and without any distortion. Enter some keywords in the search box, and then you’ll get a bunch of choices instantly. Moreover, there are hundreds of stylish text fonts and nicely-designed word arts are available at your disposal. So you don’t need to search the web for free fonts anymore. Icons and fonts are both customizable. You can adjust them with various effect tools to make your logo more attractive. One of the best features worth mentioning is that DesignEvo offers a preview mode. It gives a great visual support that helps you visualize your created logo as it would show on a T-shirt, business card, letterhead, wall, website, and several other marketing materials. DesignEvo allows you to save your logo as a project in its cloud storage. So you can go back and work on it for more edits, avoid wasting time and losing any content. Alternatively, you can save it on your computer directly for immediate use. DesignEvo allows you to download logos in JPG or PNG formats with a maximum resolution of 500 x 500 pixels at ZERO cost. 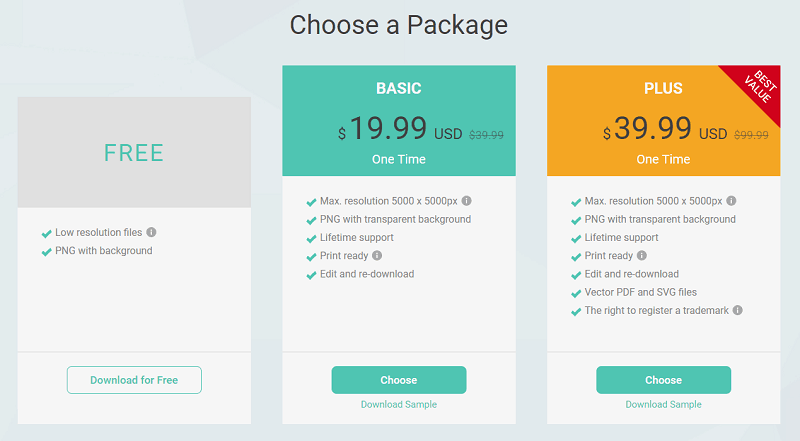 It’s okay for using online, but if you need higher resolution for printing needs, you need to pay for a small amount of one-time fee to upgrade your free logo to premium. You can see the details below. Without a doubt, DesignEvo definitely stands out in the crowded logo design market. It is super easy to use and offers you almost everything you need for a quality logo design all under one single roof. Take a moment to check it out, you’ll find that to be a logo design expert is just a few clicks away. Every business owner and marketer obviously understands that importance of a well designed logo, and what harm a poorly designed one can cause your to a business. I’ve seen a lot of companies pay less concern to their company logo, and I usually wonder why that should be. It’s always important to take time and create the very perfect logo for your business as it’ll eventually affect how your business is perceived by the public. However, the most difficult part is always getting a good logo designer to give you the best, even though it’ll cost a lot of money to hire such a person. But I believe it’s always worth the price. I’ve never used a third party software for my logo creation, as I’m not that much good in graphics. Hence, I always hire good designer. This is the first time I’m hearing about Designevo, and from your review, it seems to be a good tool for logo creation. The most interesting part as you said is that it’s user friendly, and does not require much learning curve. I’ll definitely check it out man. Visited the website, looks like one really can design great logo.. a lot of templates definitely could make the work easier… The icons seem to be high quality and not losing the resolution at all. Thanks for the share. Have a great day ahead!